Prettau® Zirconia is the material of choice for frequently occurring problems like reduced available space, bruxism or ceramic chipping. It offers a functional and at the same time aesthetical solution. Due to these characteristics and if used in conjunction with a special coloring technique, the use of veneer ceramics can be entirely eliminated. 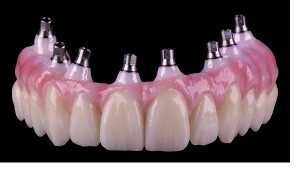 In this way, aesthetically pleasing full-zirconia restorations (i.e. the Prettau® Bridge) can be realized. Especially suited in case of implants, reduced available space or restorations with gingival reconstruction. 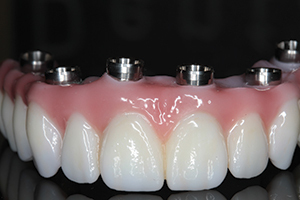 PRESENTING OUR NEW ZIRCONIA MATERIAL Prettau® Anterior® extremely translucent zirconia for the elaboration of single crowns, inlays, onlays, veneers and at maximum 3-unit bridges (full contoured or reduced structures for ceramic layering). This fact guarantees longevity, because there are no black margins in case of age-related retreat of the gums, as this might be the case with metal restorations. Furthermore, this very acid-proof material prevents the absorption of pollutants and makes cleaning easier.